Today’s post is the next installment in our series about running. Katie Seevers is a homeschooling mom of 6 littles, including two children recently adopted from Ethiopia. Katie will be serving as the Team Captain for this year’s I Run For Cupcakes Team. 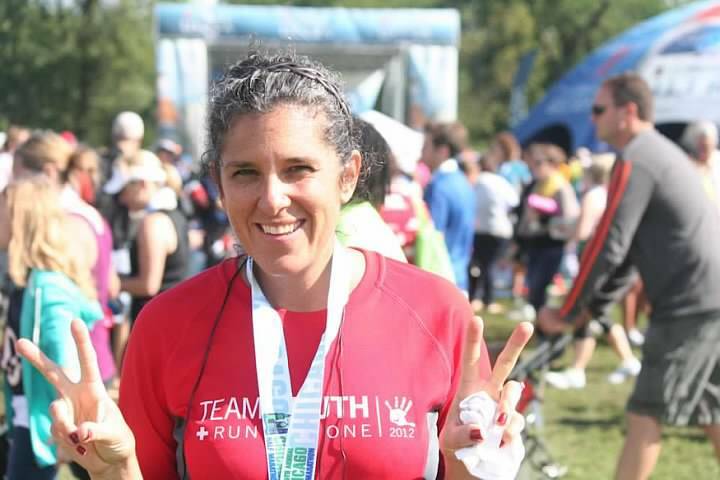 Read her story, get inspired and join her team for the Nashville Half Marathon this April! Running really has become a passion of mine over the last 6 years. I was never into running. Sure I ran track in highschool, but not because I was fast or even good at it. Rather, because it was a social event. Everyone was doing it, and I wasn’t about to miss that boat. In high school, I ran short distances… like the 100 yard dash. and the 200. On practice days, I could barely get through the 1 mile warm up. Fast forward 15 years, 3 kids and a few extra pounds, I decided it was time to get healthy. My girlfriend and I decided to train for our first half. I was amazed when I hit the 5 mile mark. Then 7… 10 and finally 13. I was ready for the race. It was a great race day and once I crossed the finish line, I was hooked. As much as I love running and the benefits that go along with it, my love has really grown into so much more than just time alone and staying fit. Which is why in 2010, when I ran the Toledo Glass City Half, I did it in honor of our two kids from Ethiopia that we hadn’t even met. In fact, we received our referral call just 5 days before the race. This was something that I had specifically been praying for and many thought that I was praying for the impossible. In the months leading up to the race, I was on my face before the Lord asking Him to please allow us to have our referral of our child/children before race day, as it would be a great way to make it through those difficult miles, if I could envision my sweet kids’ faces. But the odds were against us as we were still pretty far down the waiting list, and things were slowing down drastically for international adoption in Ethiopia. We feared the country would close all together. Every day I woke up saying, “Lord? is today the day?? Will we see our children’s faces today?” I asked this every day for about a month. I wrote about it in my blog posts. I talked about it as I was raising money for our adoption. It was bold. It was sure to fail. But isn’t that the best time to have hope, to believe? When all the odds are against you, many times that’s when the Lord shows up… to show off. And He did. It was 5 days before the race and I woke up again praying this prayer, “Lord there are only 4 short business days to receive our referral call before this race, today would be a good day to see our kids faces.” A few hours later, the infamous 703 area code showed up on my phone. It was our referral call. On race day, I ran knowing that there was a little boy and baby girl waiting for us in Ethiopia. The Lord had indeed answered our prayer. This year I ran with Project Hopeful and TeamTruth. This held special meaning as both our kids that we were adopting had been diagnosed with HIV. Project Hopeful’s mission statement is to “Educate, Encourage and Enable Families Adopting Children with HIV and AIDS”. PH was extremely helpful in educating us about HIV and adoption. This was a great opportunity to give back to an organization that had such a great impact on our decision to adopt kids with special needs. I was able to be a part of their first annual team, raising a total of $30,000 for Project Hopeful. As I crossed the finish line, I balled my eyes out. Yes, I was physically exhausted, and drained, but my heart was swelling with love for my two kiddos, as well as the hundreds of other children who would benefit from this race. I’m pleased to be joining IRFC (I run for Cupcakes) to run in the Nashville Half Marathon on April 27th, 2013, in an effort to raise funds for Sixty Feet. This ministry works on the ground in Uganda, “bringing hope and restoration to the imprisoned children of Africa in Jesus’ name”. I can’t think of a better way to impact the lives of children around the world who continue to be forgotten.